MobileReview is claiming that Nokia also signed up to produce an Android handset in early 2012. You might think that on the whole that might be false. But some things do not match. The CEO’s memo and speech mentions that Nokia is getting out-marketed in 3 distinct areas; low cost feature handsets, middle cost smartphones, and high end smartphones while mentioning Apple, Android, and RIM. Yet the slide shown shows WP7 taking the high end and middle smartphone market from Nokia and that slide doe snto match market data. The words used to describe the Nokia-MS partnership echo other MS mobile partnerships in which the OEM used MS to put out a WindowsMobile handset while at the same time putting out a competitor OS smartphone and later put their weight around that competing OS. Those OEMs who have taken that path in the past are HTC, Samsung, SonyEricsson, Motorola, and several others. The indication that this would be true would of course be Nokia joining OHA. At this point I do not see any indication, despite MobileReview’s claim, that its true. With Packt Publishing attempting to recruit me as an android 3.0 development book author and an android training opportunity position opening up in downtown Chicago, I once again have the opportunity to think about how android development should be taught in class form and book form. Its not that there are not stellar resources already out there such as Mark Murphy’s, etc. Its how do you reach the maximum audience about the power of this new mobile platform through developing code in java/C++ and js/html/css. First, mobile programming is different. Some of the differences is that its a casual application that does not operate or run-all-the-time. Its security context is around both user authentication within the mobile operator system and the google user system. Its not big screens like the server or desktop. There are also other differences as well in that not every member of the audience is java programmer as many web programmers are switching to android not just the PhoneGap applications but also the more heavy duty in CPU cycles applications such as games, etc. My respectful disagreement with Markana Inc. was that there is enough basic java patterns in android java programming itself that one could use the android device to teach java. In android java we use a modified mobile definition of singleton from the javaME area. That theory of why we use it is still valid java programming technique. 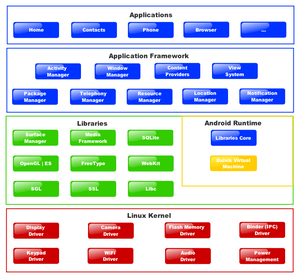 The android mobile platform uses callbacks. the callback pattern is of course acting as a program pointer, something in java we do not have at the moment. The same pattern and theory are found in complex java systems on the enterprise side. There are also such things as teaching the development process such as debugging, unit-testing, BDD and TDD, and of course best practices in dealing OEM-device-differentiation(press calls it android fragmentation). Than we have the subject of adding a native library to extend android to be able to use in an application. Hopefully I get an opportunity to explore these subjects shortly. Joe Hewitt, funny the complaints about open coming from a Facebook developer, the same firm troubled by privacy gaffles, not being open, etc. Lets back track a bit. Other OSes claiming open in mobile devices. Symbian, at first Symbian source tree was not accessible and viewable by outsiders much like Android. JavaME, same deal. You see folks, its normal in mobile operating systems and in fact in any operating system with multiple stakeholders to at some point in the incubation period for the master source tree to be not viewable to outsiders. The claim of it does not have this or that so must not be open is a bit of FUD to distract us from discussing other issues such as the consumer should have a choice in OSes, mobile operator device/service plans, etc without shackles of any OEM or Mobile Operator and Apple’s policy of locking down the consumer is somewhat wrong and miss-guided. I did some hacking yesterday with Calculon in a attempt to see if it could be extended similar to robotium. Not possible, robotium is the best option..sorry MK(Calculon developer). Thus, we have a IDE plugin or build that runs all the tests at one time and completes a code coverage report along with a DSL syntax to reduce the complexity of writing unit tests. It will not be as pretty as say Spock, but still it reduces test writing expertise to something manageable. But Android emulation is unique in that we have to start up anew AVD to test a different device model. The obvious next step is to get some way to start and stop the AVDs in your emulator inventory and run install-app and tests each time and produce test reports for each device model. Apache ANT is too brittle of DSL to be flexible enough to work as a work-flow testing scenario. This might be an ideal situation to use Gradle in as it uses Groovy’ DSL with the ability to run/execute ant tasks/targets, maven stuff, ivy, etc. 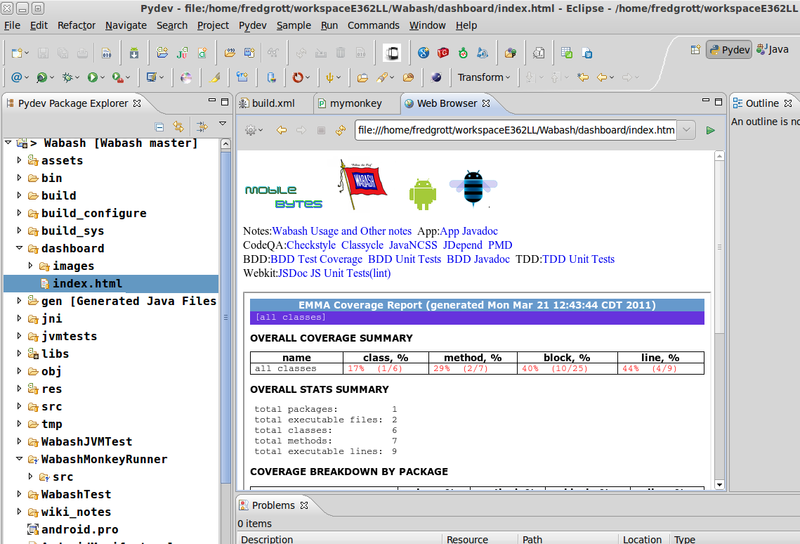 Dependency Injection vs Mock wise I do not see a need in testing to resort to DI if you have Android-Mock available. But maybe some developers prefer to use DI rather Android-Mock, it just seems that yuo are moving your focus away from tests up the DI chain if you pursue that route.